Multilayered materials and structures are of special interest to both academic researchers and industrial engineers as they have been used in an increasing number of applications, such as micro- electromechanical system (MEMS) on polymer substrate, protective coating on metal structure for anti-corrosion, ceramic coating on metal substrate for abrasion resistance, thermal barrier coatings, metal or metal oxide coating on metal-coated polymer for reflectance tuning and protection, as well as laminated composites and structures, etc. However, the surface layer and joint interface are commonly prone to premature failures because of cracking and delamination due to their different thermal and mechanical properties. In return, the premature failures will affect the performance and structural integrity of the device and eventually cause the failure of the multilayered structures to perform their functions. Therefore, it is essential to understand the mechanical behavior and corresponding failure mechanisms of the multilayered systems. 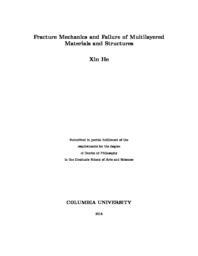 This Ph.D. dissertation focuses on the study of opening-mode fracture (OMF) behavior and interfacial delamination in different types of multilayered structures, such as the aluminum plate or wire with alumina protective coating, multilayered advanced polymeric reflectors, and asphalt pavements. In addition, another failure mechanism, i.e. the material degradation and aging, is also studied. Firstly, a two-dimensional (2D) elasoplastic fracture model in Cartesian coordinates is developed to study the OMF in the thin alumina film fully bonded to an aluminum plate undergoing large- scale yielding. The stress field in the coating layer is described by one section between two adjacent cracks. The 2D plane strain formulations are employed to analyze the elastic field in the thin film, while a one-dimensional (1D) linear hardening plastic model is applied to account for the large plastic deformations in the substrate under substantial yielding. An elastoplastic shear lag model is established to transfer the tensile stress in the substrate to the thin film. General formulations and explicit expressions of the elastic/elastoplastic solutions of the thin film/substrate system under different loading stages have been presented. The elastic field in the thin film is then verified with the finite element (FE) results. The fracture energy release rate (ERR) is calculated and corresponding elastoplastic fracture analysis is conducted. Experimental characterization is further conducted to validate the present model; the results show that this fracture modle can capture the fracture initiation, infilling, and saturation in the thin film successfully. This model has been extended to cylindrical coordinates, where the alumina coating is fully bonded to an aluminum wire/rod. Due to the axial symmetry, the proposed 2D elasoplastic fracture model has been reproduced in polar coordinates and be used to study the OMF behavior of alumina coating fully bonded to an aluminum wire. For the case where thermal loading is applied on coating/substrate structures, neither the plane strain nor plane stress assumption can be applied because the thermal loading would introduce multi axial normal stress, therefore, a three-dimensional (3D) elastic fracture model is then developed to study the OMF in the coating fully bonded to the elastic substrate. When the temperature change reaches a certain level, block cracking will initiate in the surface layer to release the accumulated thermal stress. For simplicity, we assume the top surface of the coating would keep flat and in a rectangular shape after deformation. Then the elastic field in both coating and substrate is analyzed and verified with the FE results. The fracture ERR is then obtained based on the solved elastic field and used to analyze the fracture initiation, infilling, and saturation. In order to verify the fracture analysis, the theoretical fracture analysis results are compared with FE simulation results based on the cohesive zone model (CZM) and experimental data from the literature. The good agreement demonstrates the accuracy of the proposed 3D fracture model. In addition, this model for coating/substrate system is extended to study multilayered structures with arbitrary number of layers. In order to verify this extended model, the predicted elastic field in an advanced polymeric solar reflector is compared with FE simulation results and parametric studies are conducted to investigate the effect of geometry on the accuracy of this model. Furthermore, the fracture behavior of the surface layer in the advanced polymeric solar reflector is studied using the calculated fracture ERR. structures, is then studied. The delamination fracture energy of a multilayered glass solar reflec- tor is tested by employing the width-tapered beam method. The testing results indicate that the weakest interface of the multilayered solar reflector would be the glass-copper interface with a de- lamination fracture energy 4.4 J/m2. Using the tested fracture energy as an input, an FE model is built based on the CZM and the returned peeling force from simulation is then compared with the test results to verify the accuracy of the test method. The good agreement between the simulation and test results demonstrates that the width-tapered beam method is accurate enough to measure the delamination fracture energy of this multilayered solar reflector. Additionally, the effect of aging on the delamination fracture energy is investigated by measuring the delamination fracture energy after 50 hrs’ accelerated aging test. The results show that the aging has minor effect of delamination fracture energy for samples with alumina (Al2O3) protective coating, while it reduces the delamination fracture energy for samples with titania (TiO2) protective coating. As another failure mechanism, the material degradation or aging behavior is studied in this dissertation. The weight percentage of oxygen (WPO) in three types of asphalt binders extracted from reclaimed asphalt pavements (RAPs) and one extracted from fresh Hot Mix Asphalt (HMA), that have been aged under continuous ultraviolet (UV) or UV/moisture/condensation exposure for different period, is measured using a energy-dispersive X-ray spectroscopy (EDX). Then the tested data are fitted based on two classic aging models, namely the fast-rate constant-rate (FRCR) and nonlinear differential dynamic (NDD) models. The good fitted results show that both FRCR and NDD models can capture the aging behavior of asphalt binders extracted from both RAPs and fresh HMA under continuous UV or UV/moisture/condensation exposure. Meanwhile, although exposed under UV for the same time, the WPO in samples after UV/moisture/condensation aging are lower than those in samples after continuous UV aging, which indicates that condensation and moisture reduce the UV-induced photo-oxidative aging rate.